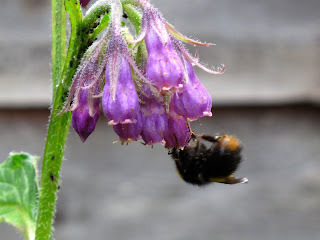 Yesterday I was following a queen Bombus terrestris, as usual, with the faint hope one will nest in my garden when she landed on a comfrey patch. This was the first time I have seen this species on comfrey, their deep flowers are mostly visited by Bombus pascuorum, B. hypnorum and B. pratorum*, in addition to Anthophora plumipes. The heavy queen landed on top of the flowers, and I was able to approach without disturbing her. She noisily bit the top of a flower and then inserted her tongue on the resulting hole. She then moved to another flower and repeated this behaviour quite a few times before leaving the patch. I was too fascinated watching and I didn't take any photos, fortunately, forensic evidence was left behind and I could take a shot of the actual holes easily spotted in the flowers (above). This queen was engaging in 'nectar robbing', a not uncommon behaviour amongst Bombus terrestris, by which individuals can feed from flowers where nectar is not accessible via the corolla opening. Flowers that are 'robbed' might have a complex floral morphology adapted to attract specific pollinators - for example, nectar can be located in a deep spur; or flowers might have lips that need force opening for entering, or the corolla could be just too deep to reach the nectar inside. Nectar robbing - described by Darwin - is another of the aspects of the foraging repertoire of B. terrestris, which, despite its short-tongue it is an impressively resourceful species. Research has shown how queens learn by experience where exactly to perforate the flowers to reach the nectar optimally, and how they switch to use previously made holes to feed when the proportion of perforated flowers reaches a threshold (secondary nectar robbing, of which honeybees and other bumblebees also benefit). Surprisingly, and despite its negative name, nectar robbing is not necessarily detrimental to the plant. 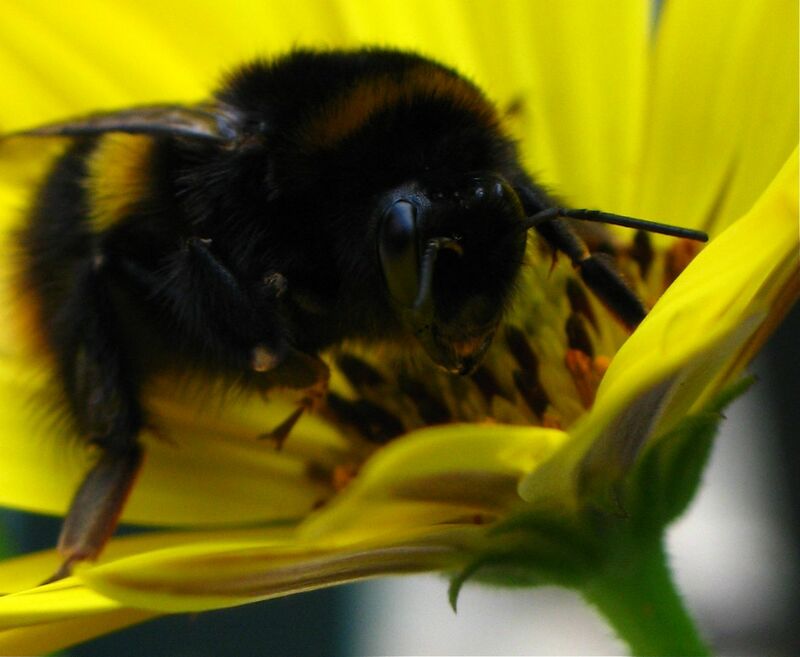 The studies comparing seed set on 'robbed' vs. normally visited flowers in bumblebees show that either there is no effect on seed set or an increased seed set when 'robbed', indicating that nectar robbers are indeed involved in pollination. In addition, nectar robbing can happen at the margins of the plant distribution, where the usual long-tongued pollinators might be absent and the 'robbing' could be the only chance for seed set in self-incompatible species. 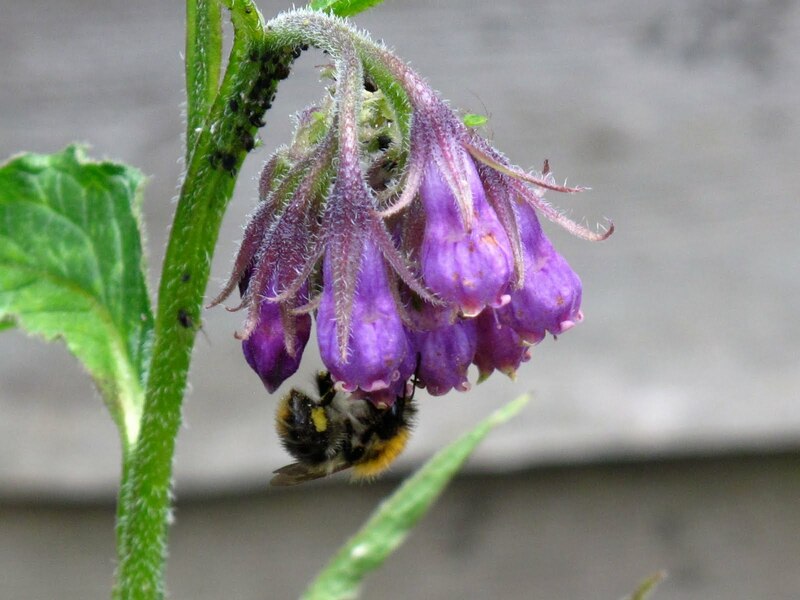 Although to avoid this 'robber-like pollinators' has been proposed, I myself thin that a more suitable name for hole-making bumblebees could be 'floral engineers'. 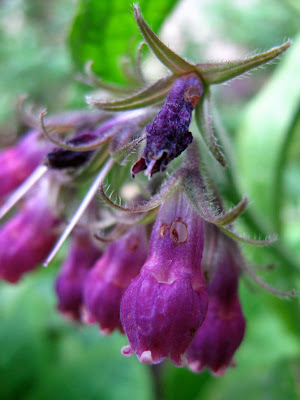 A B. pratorum feeding on comfrey. Despite its short tongue it feeds via the corolla opening, I guess it must be able to reach the nectar due to its small size, maybe able to stick its head into the corolla itself, or it might be just collecting pollen. B. pratorum has also been reported as a primary nectar robber.